The Poles of Cold are the places in the southern and northern hemispheres where the lowest air temperatures have been recorded. In the southern hemisphere, the Pole of Cold is currently located in Antarctica, at the Russian (formerly Soviet) Antarctic station Vostok at 78°28′S 106°48′E﻿ / ﻿78.467°S 106.800°E﻿ / -78.467; 106.800﻿ (Vostok). On July 21, 1983, this station recorded a temperature of −89.2 °C (−128.6 °F). This is the lowest naturally occurring temperature ever recorded on Earth. Vostok station is located at the elevation of 3,488 m (11,444 ft) above sea level, far removed from the moderating influence of oceans (more than 1,000 km [620 mi] from the nearest sea coast), and high latitude that results in almost three months of civil polar night every year (early May to end of July), all combine to produce an environment where temperatures rarely rise above −25 °C (−13 °F) during summer and frequently fall below −70 °C (−94 °F) in winter. By comparison, the South Pole, due to its lower elevation, is, on average, 5 to 10 °C (9 to 18 °F) warmer than Vostok, and the lowest temperature ever recorded at the South Pole is −82.8 °C (−117 °F). It is generally thought that Vostok is not the coldest place in Antarctica, and there are locations (notably, Dome A) that are modestly colder on average. The now inactive Plateau Station, located on the central Antarctic plateau, recorded an average yearly temperature that was consistently lower than that of Vostok Station during the 37-month period that it was active in the late 1960s, with its average for the coldest month being several degrees lower than the same statistic for Vostok. Plateau Station never recorded a temperature that surpassed the record low set at Vostok. However, temperatures at Plateau Station were only recorded during the 37 months that it was active. Had a lower temperature than the Vostok record occurred there at a later date, it would never have been recorded. Monitoring stations in Antarctica are few and far between; prior to 1995, Vostok was the only research station on the Antarctic Plateau above the elevation of 3,000 m (with the exception of Plateau Station during the brief period that it was active in the 1960s), with no other stations for several hundred kilometers in any direction. Temperatures below −89.2 °C (−128.6 °F), if they did occur elsewhere, would not have been recorded. The automatic weather station at Dome A was only installed in 2005, and has recorded −82.5 °C (−116.5 °F) as the coldest so far (2010). However a review of satellite measurements taken between 2010–2013 found several places located along a ridge between Dome A and Dome F which recorded even lower temperatures of −92 to −94 °C (−134 to −137 °F), with the lowest reliable temperature being −93.2 °C (−135.8 °F) recorded in 2010, at 81°48′S 59°18′E﻿ / ﻿81.8°S 59.3°E﻿ / -81.8; 59.3, at an elevation of 3,900 m (12,800 ft). The extreme low temperatures are found in hollows slightly below the peak of the ice ridge, where cold air gets trapped as it flows downhill, and since the same low temperature ranges were detected at several different sites along the ridge across multiple years, it is thought this may be the lowest temperature achievable under local atmospheric conditions. In the northern hemisphere, there are two places in the Sakha Republic (Yakutia), Siberia, Russia that vie for the honour of being considered the "Pole of Cold" in winter. These are Verkhoyansk (located at 67°33′N 133°23′E﻿ / ﻿67.550°N 133.383°E﻿ / 67.550; 133.383﻿ (Verkhoyansk)) and Oymyakon (located at 63°15′N 143°9′E﻿ / ﻿63.250°N 143.150°E﻿ / 63.250; 143.150﻿ (Oymyakon)). In December 1868 and then in February 1869 Ivan Khudyakov made the discovery of the Northern Pole of Cold by measuring a record temperature of −63.2 °C (−81.8 °F) in Verkhoyansk. Later, on January 15, 1885, a temperature of −67.8 °C (−90.0 °F) was registered there by Sergey Kovalik. This measurement was published in the Annals of the General Physical Observatory in 1892; by mistake it was written as −69.8 °C (−93.6 °F), which was later corrected. One can still find this incorrect value in some literature. The coldest reliably measured temperature in Verkhoyansk was −67.6 °C (−89.7 °F) on February 5 and 7 of 1892. On February 6, 1933, a temperature of −67.7 °C (−89.9 °F) was recorded at Oymyakon's weather station. This is the coldest reliably measured temperature for the Northern Hemisphere. The weather station is in a valley between Oymyakon and Tomtor. The station is at 750 m (2,460 ft) and the surrounding mountains at 1,100 m (3,600 ft), causing cold air to pool in the valley: recent studies show that winter temperatures in the area increase with elevation by as much as 10 °C (18 °F). The small rural locality of Delyankir, also in the Sakha Republic, has a lower average temperature throughout all winter months than either Oymyakon or Verkhoyansk, as well as a lower yearly average. Its record low temperature of −65 °C (−85 °F) is slightly higher than the record lows set at Oymyakon and Verkhoyansk, however. ^ N.A. Stepanova. "On the Lowest Temperatures on Earth" (PDF). ^ "Northern Hemisphere: Lowest Temperature". WMO. Archived from the original on 2012-04-20. Retrieved 2010-06-19. The polar climate regions are characterized by a lack of warm summers. Every month in a polar climate has an average temperature of less than 10 °C (50 °F). Regions with polar climate cover more than 20% of the Earth’s area. Most of these regions are far from the equator, and in this case, winter days are extremely short and summer days are extremely long. A polar climate consists of cool summers and very cold winters, which results in treeless tundra, glaciers, or a permanent or semi-permanent layer of ice. Verkhoyansk is a town in Verkhoyansky District of the Sakha Republic, Russia, located on the Yana River near the Arctic Circle, 92 kilometers (57 mi) from Batagay, the administrative center of the district, and 675 kilometers (419 mi) north of Yakutsk, the capital of the republic. As of the 2010 Census, its population was 1,311. The town holds the Guinness world record for the greatest temperature range on Earth: 105 °C (189 °F). The climate of Antarctica is the coldest on Earth. The lowest air temperature record on Antarctica was set on 21 July 1983, when −89.2 °C (−128.6 °F) was observed at Vostok Station. Satellite measurements have identified even lower ground temperatures, with −93.2 °C (−135.8 °F) having been observed at the cloud-free East Antarctic Plateau on 10 August 2010. 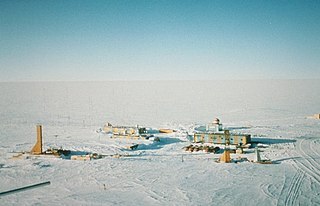 The lowest natural temperature ever directly recorded at ground level on Earth is −89.2 °C at the Soviet Vostok Station in Antarctica on 21 July, 1983 by ground measurements. Vostok Station is a Russian research station in inland Princess Elizabeth Land, Antarctica. Founded by the Soviet Union in 1957, the station lies at the southern Pole of Cold, with the lowest reliably measured natural temperature on Earth of −89.2 °C. Research includes ice core drilling and magnetometry. Vostok was named after Vostok, the lead ship of the First Russian Antarctic Expedition captained by Fabian von Bellingshausen. The Köppen climate classification is one of the most widely used climate classification systems. It was first published by the Russian climatologist Wladimir Köppen (1846–1940) in 1884, with several later modifications by Köppen, notably in 1918 and 1936. Later, the climatologist Rudolf Geiger introduced some changes to the classification system, which is thus sometimes called the Köppen–Geiger climate classification system. Oymyakon is a rural locality in Oymyakonsky District of the Sakha Republic, Russia, located along the Indigirka River, 30 kilometers (19 mi) northwest of Tomtor on the Kolyma Highway. It is one of the coldest permanently inhabited settlements on Earth. 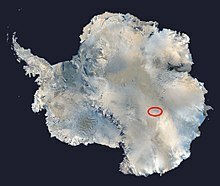 Dome C, also known as Dome Circe, Dome Charlie or Dome Concordia, located at Antarctica at an elevation of 3,233 metres (10,607 ft) above sea level, is one of several summits or "domes" of the Antarctic Ice Sheet. Dome C is located on the Antarctic Plateau, 1,100 kilometres (680 mi) inland from the French research station at Dumont D'Urville, 1,100 kilometres (680 mi) inland from the Australian Casey Station and 1,200 kilometres (750 mi) inland from the Italian Zucchelli station at Terra Nova Bay. Russia's Vostok Station is 560 kilometres (350 mi) away. Dome C is the site of the Concordia Research Station, jointly operated by France and Italy. The Antarctic Plateau, or Polar Plateau or Haakon VII Plateau, is a large area of East Antarctica which extends over a diameter of about 1,000 kilometres (620 mi), and includes the region of the geographic South Pole and the Amundsen–Scott South Pole Station. This huge continental plateau is at an average elevation of about 3,000 metres (9,800 ft) high. Dome Fuji, also called Dome F or Valkyrie Dome, is an Antarctic base located in the eastern part of Queen Maud Land at 77°30′S 37°30′E. With an altitude of 3,810 m or 12,500 ft above sea level, it is the second-highest summit or ice dome of the East Antarctic ice sheet and represents an ice divide. Dome F is the site of Dome Fuji Station, a research station operated by Japan. Plateau Station is an inactive American research and South Pole—Queen Maud Land Traverse support base on the central Antarctic Plateau. Construction on the site started on December 13, 1965, and the first traverse team arrived in early 1966. The base was in continuous use until January 29, 1969, when it was closed but mothballed for future use, and was the most remote and coldest of any United States stations on the continent. It was also the site for the world's coldest measured average temperature for a month at that time, recorded in July 1968, at −99.8 °F (−73.2 °C). Ridge A is a site in Antarctica that was identified in 2009 as the best suited location on the surface of Earth for astronomical research. 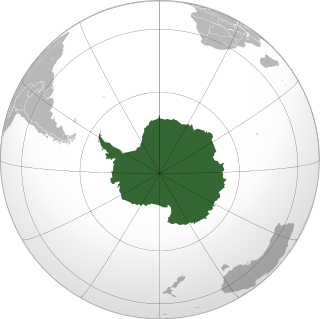 The site, approximately 1,000 kilometres (620 mi) from the South Pole and 144 kilometres (89 mi) southeast of Dome A, is situated in a portion of Antarctica claimed by Australia in the Australian Antarctic Territory. An ice cap climate is a polar climate where no mean monthly temperature exceeds 0 °C (32 °F). The climate covers areas in or near the polar regions, such as Antarctica and Greenland, as well as many high mountaintops. Such areas are covered by a permanent layer of ice and have no vegetation, but they may have animal life, that usually feeds from the oceans. Ice cap climates are inhospitable to human life. Antarctica, the coldest continent on Earth, sustains no permanent human residents, but has some civil inhabitants in proximity to research stations in coastal settlements that are maritime polar and there are some communities that are situated in a transitional zone between the two climates, but barely qualify as a tundra. Some places like Antarctica had a different climate before having an ice cap climate. Delyankir is a rural locality under the administrative jurisdiction of the Settlement of Artyk in Oymyakonsky District of the Sakha Republic, Russia, located 44 kilometers (27 mi) from Artyk on the Kolyma Highway on the border with Magadan Oblast. Its population as of the 2010 Census was three people, down from four recorded during the 2002 Census.